Carbon steel, carbon structural steel, free cutting steel, cold heading steel, cold rolled steel, alloy steel, bearing steel, stainless iron, stainless steel; ductile iron etc. Heat treatment & sand blasting. Other surface per customer's request. PPAP Document could be submitted if required. Stamping - Rolling, forming, punching, bending, deep drawing. Metal fabrication (machining) - Wire EDM, drilling, turning, milling, grinding. 4) International sales who were trained the technical know-how spot check before shipping. 1. More than ten years experience in metal fabrication and wide experience in serving overseas OEM customers. 2. 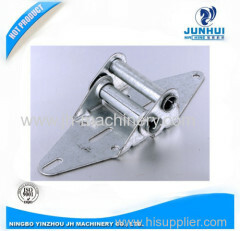 Provide one-stop solution in metal parts. 4. Low volume orders and sample orders are acceptable, and Just-In-Time delivery. 5. Professional customer service in 24 hours and hard work to meet customers' requirements. 6. Quality control with professional experienced QC team. Weclome to send us your drawing or specification of products, we could do analysis and quote to you soon.